With the cold and rainy days ahead Circu prepared the coziest pieces to bring comfort and joy to one’s little kids’ special place: their room. From earth inspired pieces to colorful beds, a mom or a dad won’t want to forget to bring a special touch to their child’s room this season with Circu’s wonderful suggestions. 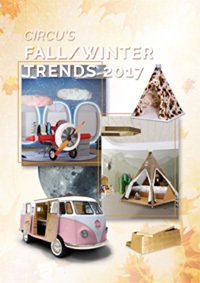 “Using the season’s color trends will surely add a stylish touch to the fantasy world of children. This fall’s fashion colors sure will add that extra fashion and cozy touch to the imaginary of our kids’ bedroom” Andre Oliveira, Head Designer. TEEPEE ROOM (Bed): Teepee, also spelt tipi, is reminiscent of traditional Indian teepees. Circu’s Teepee is a bedroom inspired by the free-spirited and highly spiritual young woman, named Pocahontas. She loves adventure and nature. Nowadays, teepees are as in as the newest and latest kids’ room ideas and playing activities. Using Pantone’s Butterum color that brings a nature and forest feel inside the bedroom for a cozy autumn sleep. TEPEE PLAY (Playground): No kid’s room is complete without a stellar playhouse, teepee or tent. The color of this piece mixes a beige with Pantone’s Tawny Port for a comfy fall play session. SKY DESK: Sky Desk is a desk inspired by Disney movie “Planes” It is the perfect combination for your aviator inspired bedroom decoration. This desk uses Pantone’s Grenadine color for a vivid and joyful study area. BUN VAN (Bed): Bun Van is a bed, reinvented by CIRCU. This bed is perfect to bring some fun and imagination to rooms! This version in a Ballet Slipper Pantone is perfect for girls’ room. MOON Rug: Moon Rug is the ideal piece for your little astronaut or adventurous kid room. It can be used as his spot of fun and play and also brings a warm decoration to the space which is perfect for a fall winter décor. This rug uses the Pantone Neutral Gray for a perfect lookalike moon. TOY BOX FAMILY (Gold, Silver and Copper): The perfect match for any kid’s fall/winter bedroom décor are these toy boxes that match perfectly any décor while adding extra storage. Meet the toy box family: Gold, Silver and Copper. With these amazing suggestions, Circu brings fun to the kids’ bedroom fall/winter décor. These are the coolest pieces every kid will be wanting this year.